How do I explain the existence of everything? If I believe that everything comes from nothing, how is it that nothing is communicating with me in meaningful ways? If I believe that everything is the result of chance, why do I make truth claims? How can something/anything be right or good – wrong or evil if there is no truth and no order in nature? Is it logical to assert scientific knowledge or truth if there’s no design or meaning to reality and existence? If so, how and why? Does truth exist? Is truth knowable? What is a lie? If I’m matter only, how can I think, speak and know truth? Truth is that which conforms to reality – the way things really are. Truth is an affirmation of what’s real. Truth is that which corresponds to the state of affairs that it purports to describe. Falsehood is what doesn’t correspond. Truth is absolute. If I say “truth is relative” I’m making an absolute truth claim. Spiritual truth is as true as mathematical truth. God is true (Romans 3:4) and tells the truth. He says what is. God’s assertions are correct. 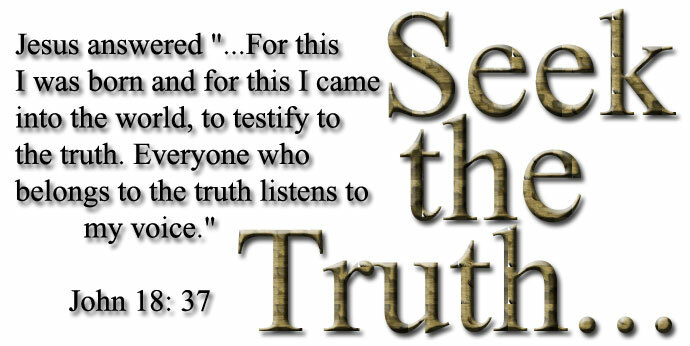 Pilate asked “What is truth?” as Jesus Christ stood in front of him. Truth isn’t what works, feels good, is relevant, sincere or determined by vote. If I try to defend the concept of truth without referencing The Truth Maker, isn’t that like trying to deny the existence of air while breathing? Can I deny air while breathing? If I try to deny the reality of truth aren’t I asserting what I say is true and depending on the one who is The Truth and who makes reason possible? If you wonder about this stuff too, you might enjoy reading the “Questions” page on our website. Jesus says “I am the truth” (John 14:6). Please consider following Jesus with us.